CompanionLink fully supports data synchronization on the new Windows 8 operating system and Metro UI. CompanionLink will sync Android, iPhone, iPad, iPad Mini, and Google web-based accounts to Windows 8. 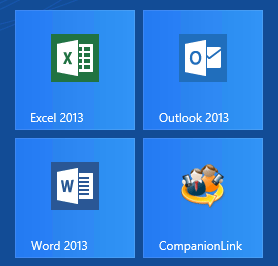 All CompanionLink version 5 products have built-in support for Windows 8. CompanionLink install as a Tile in Metro UI. Customers with older versions CompanionLink can upgrade to version 5 at a discount in order for complete support for Windows 8 and future Microsoft service packs. This entry was posted in Annoucements, CompanionLink Products by Rushang. Bookmark the permalink. Hi – have Msft sorted the issue with Windows Phone now i.e. can CompanionLink software allow Outlook on my PC to sync with WinPho8 over USB?